EcoPur Filtration for Your Hot Tub | Swim Spas OH - Leisure Time Warehouse | Hot Tubs, Swim Spas, and Pools. Ohio's Best Dealer! Everyone wants to enjoy their hot tub, but no one wants to clean it. Even if you do want to clean, keeping up with the quality of your water can be a challenge. There is nothing worse than removing the cover of your hot tub and finding the water to be dirty and murky. There is also nothing worse than swimming in a concoction of chemicals, just to keep your water clean. That’s why Master Spas has reinvented the water purification system with EcoPur Charge used in their hot tubs. 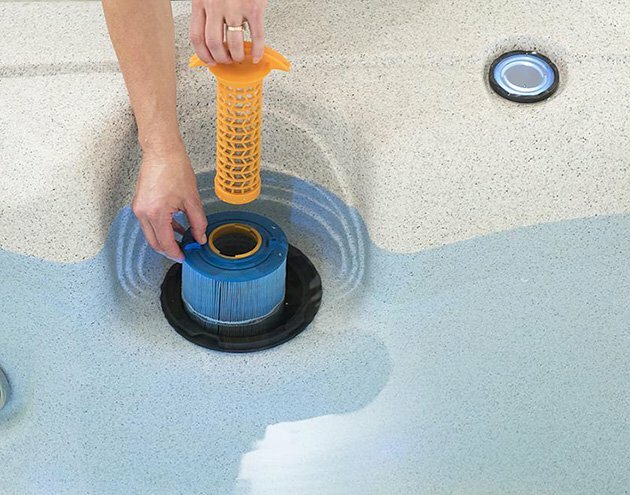 Continue reading to learn about how this incredible feature can help you get the most out of your hot tub and your hot tub cleaning experience. Clean water in your hot tub is the only way to use your hot tub. Clean water delivers optimum health and relaxation benefits. However, the typical way of purifying water, usually needs chemicals or salt to do so. These chemicals and even salt can cause corrosive damage to your plumbing, swimwear, and even your skin. Chemical-free water purification may not be an option, but the EcoPur by Master Spas uses significantly less chemicals to do less damage to your skin and more benefits to your water. Your hot tub is warm and inviting yes, but warm water is also an ideal breeding ground for bacteria, fungi, and algae. These toxins come from your hair, lotion, sunscreen, etc. The only way to purify your hot tub is to remove these toxins, and that is exactly what the EcoPur is designed to do. The EcoPur uses a tightly wrapped filtration fabric, which is loaded into a spring core. The water flows through the filter and causes a chemical reaction, which releases controlled amounts of zinc and copper into the water. Copper and zinc are the key components to creating an environment where algae, fungi, and other bacteria cannot survive. Thus, your hot tub is clean and without using harsh chemicals that corrode the important stuff. In fact, EcoPur is so unique that it even mimics the way water is filtered in nature. Today, EcoPur is only available through Master Spas. Master Spas hot tubs and swim spas are designed to perform with a level of luxury that is second to none. With your wellbeing in mind, having clean water on a consistent basis to soak in begins with the water purification system. LeisureTime Warehouse is a Top Rated Company in the Cleveland area that carries premium brand hot tubs and swim spas by Master Spas. Quality features and performance are at the core of our products and we are happy to help you select the perfect hot tub or swim spa to meet your needs. As a luxury hot tub distributor, we strive to ensure that if you want a hot tub or swim spa, you’re still able to get one even if you’re on a budget – you aren’t able to find a better price in the Greater Cleveland area. Contact us today for a Free consultation or if you are in the Cleveland area come visit our retail super store!